Just stumbled across the new Starbucks Canada marketing campaign, and I think it has a lot going for it. 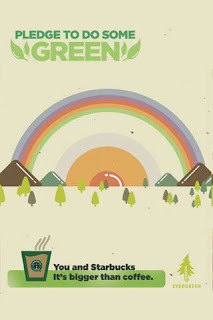 Here’s how it works: You log on to the Starbucks Canada’s Facebook page, “PLEDGE TO DO SOME GREEN”, and get rewarded with a free tall cup of Pike Place Roast coffee. Sounds pretty good, right? To redeem your coffee, you need to fill out a pledge form outlining what act of green you’re planning to carry out for your community. These range from using a reusable mug every time you visit Starbucks, to planting a children’s garden, to donating to the partner charity, Evergreen. After submitting the form, you’ll get an e-mail coupon for your coffee. It’s a great marketing campaign for Starbucks to give away a cup of coffee this way rather than just handing them out in stores. Every pledge form filled out contains a customer’s address, and other personal information. To the person filling out a pledge form, it’s 2 minutes work for a free coffee. To Starbucks, this marketing campaign will create a valuable source of demographic information. My guess is that if x number of people in your now Starbucks-starved neighbourhood are taking the time to fill out this pledge form, you can expect a new café springing up sometime soon. Also, I’m sure a lot of people redeeming their coupons for a free tall coffee are going to splurge on one of those pizza-size cookies or the signature lemon cakes. And I can’t blame them, that stuff’s delicious. Starbucks is moving marketing dollars onto social media marketing (much like Pepsi and other major corporations), focusing on green marketing, and including a free giveaway. All smart moves! I also like that that the company has partnered with a Canadian charity, Evergreen, in rolling out this campaign. If the national angle wasn’t enough, they’re encouraging you to get involved in doing green in your community. It’s a good idea for Starbucks to get its Canadian customers thinking they’re doing good in Canada and in your own neighbourhood. It’s a stretch to think people will start identifying Starbucks as a local coffee shop rather than the international megalith it is, but I think this initiative and others like it could get Starbucks a little more credibility with the “I live green and shop locally” crowd. Note: Those guys drink a lot of coffee. And imagine the future advertising opportunities that this campaign produces: The amount that Starbucks manages to raise for Evergreen will be impressive. I’m sure there will be tree plantings and community beautifications inspired by this, and that certainly creates buzz. All in all, this thing makes a lot of sense.